Pets love toys. 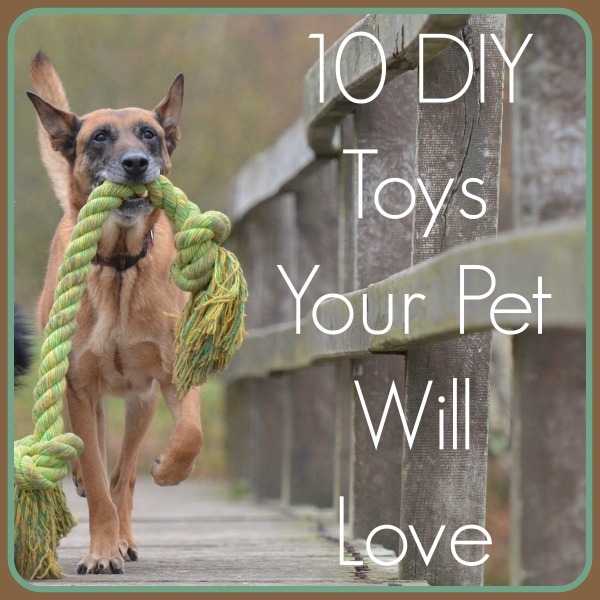 Pets love DIY toys! Anyone who owns a playful dog or cat will know how much they love their toys, and making a toy for your pet that is unique can have so many benefits. Our pets also love the scent of their owners; it makes them feel comforted and safe. In our 10 Essential Travel Tips blog we spoke about taking something from home (such as a toy or a blanket) on your travels with your pet, for the very reason that the scent of home makes them feel more comforted. This is especially true with homemade toys as your scent is even stronger. 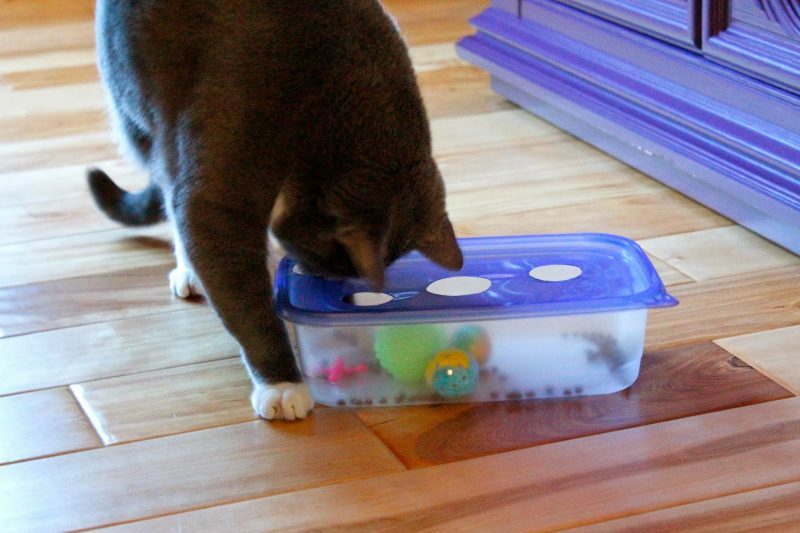 DIY toys serve another benefit; you can make them to suit your pet’s personality. Our team member, Nicole, has a Manchester Terrier who gets bored easily, she has made him lots of homemade toys and ‘boredom busters’ to keep his brain amused (and out of mischief) which he loves. He’s not very keen on solid plastic toys but loves anything soft and cuddly, so she tailors his toys to suit. Her sister, Fee, made him a homemade blanket, it can be see in photos on our 10 Travel Tips blog! We’ve done a round up on the internet of some of the best toys we’ve seen. 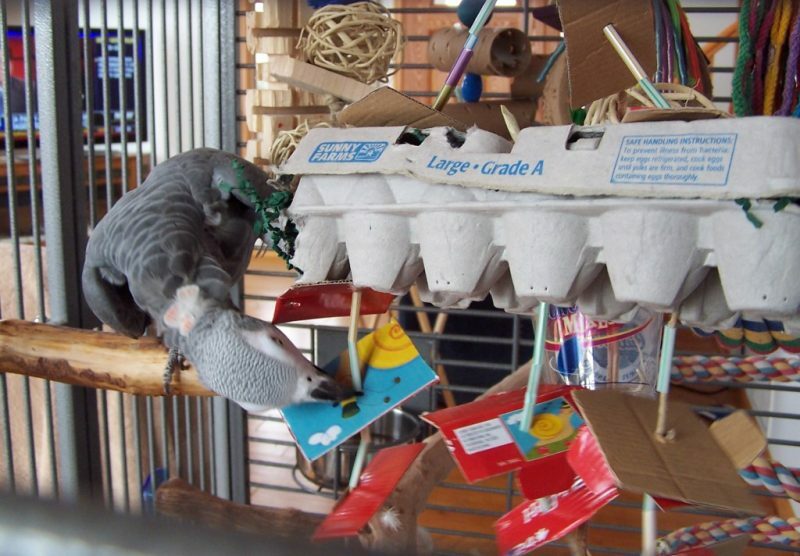 We’ve got four dog toys, four cat toys, two rabbit toys, a parrot or large bird toy, and a reptile hammock! A lot of these toys can cross over to other species too. 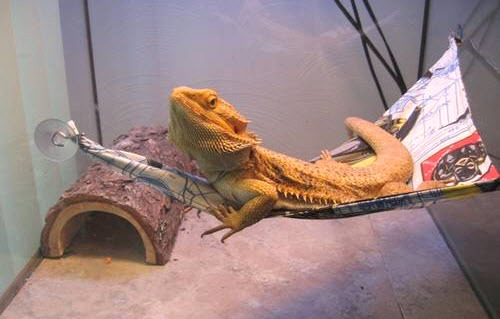 We’ve seen dogs that love cat wands and cats that love a larger version of the reptile hammock, so feel free to have a read through and see if your pet would like any of the toys we’ve got listed! 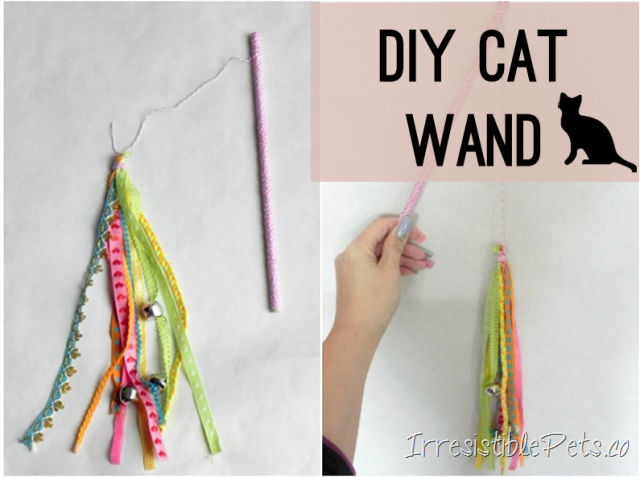 Irresistible Pets shows us another way to make a fantastic and brightly coloured wand for your cat out of scraps of material. The added bells on this one make it really great for those extra mischievous kitties! * Get the instructions here. *as a side note, we’ve also found some puppies who love these games too! This puzzle box from The Glam Cat is a great idea to keep many pets amused! Cats love the puzzle box as do dogs and some birds, best of all it can be reused lots of times just by refilling! Grab the instructions here and enjoy watching your cat work out the puzzle! If you’ve ever got home to find the arm of the sofa destroyed because Felix decided it was the perfect scratching post? If you have, this toy is for you!! 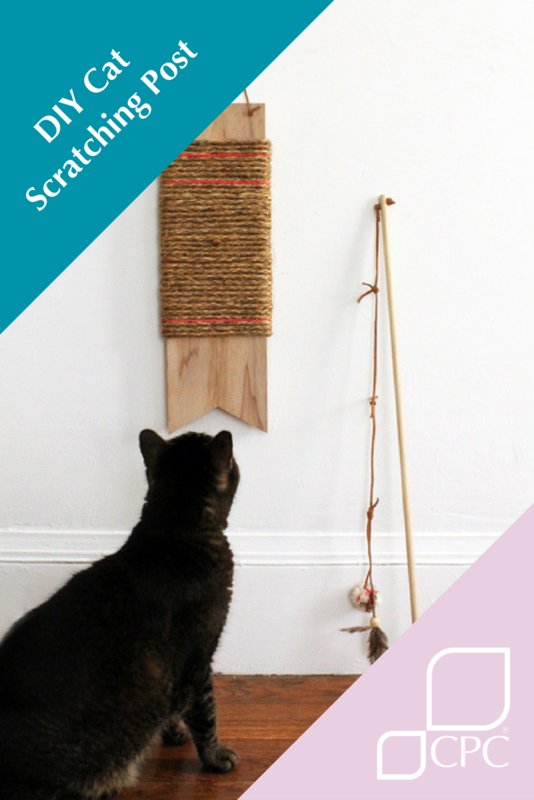 Design Sponge shares instructions here on how to make a visually attractive scratch pad (and bonus cat wand!). These toys are great because they use a lot of natural materials rather than the plastic toys our pets are used to. Get the instructions here. This one for bunnies is less of a toy and more of an inventive way to give treats! Who knew clothes lines and pegs could give so much amusement to our floppy eared friends? 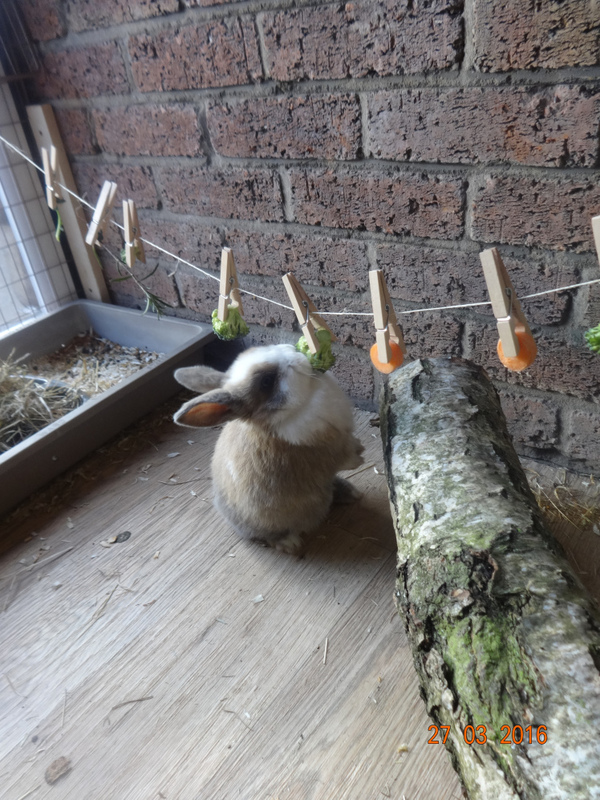 These great instructions from Mini Lop Bunnies show you how to construct this very easy treat feeder, just be warned that her bunnies have eaten through the string to get to the treats! Who says bunnies aren’t clever?? We’ve always found the Rabbits United forum to be a great source of rabbit-related info, and this toy is no different! 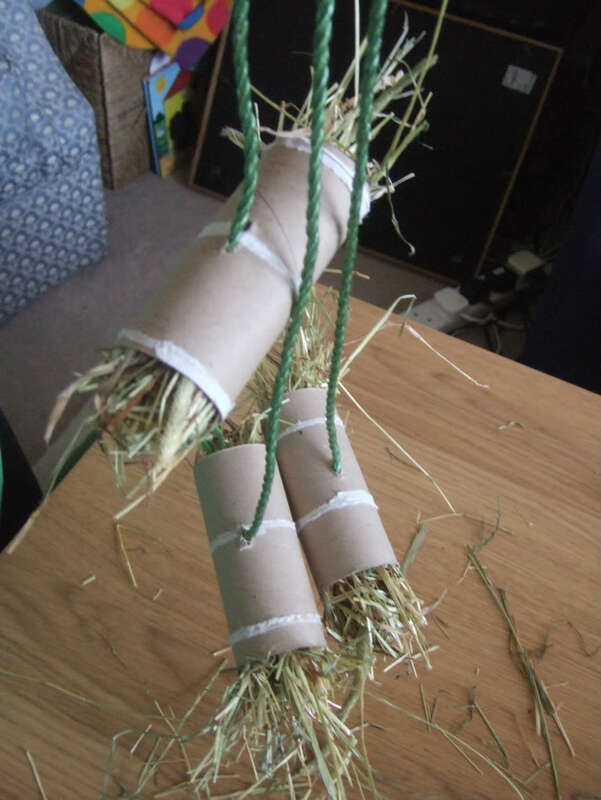 Using simple string and empty toilet paper tubes, you can great a great hay holder for your rabbit! See the instructions (plus cute video!) here. P.S. This one can be used in conjunction with the Bunny Peg Line! This tennis ball braid is an upgrade form a previous toy featured by Kerry Ball from With My Camera. 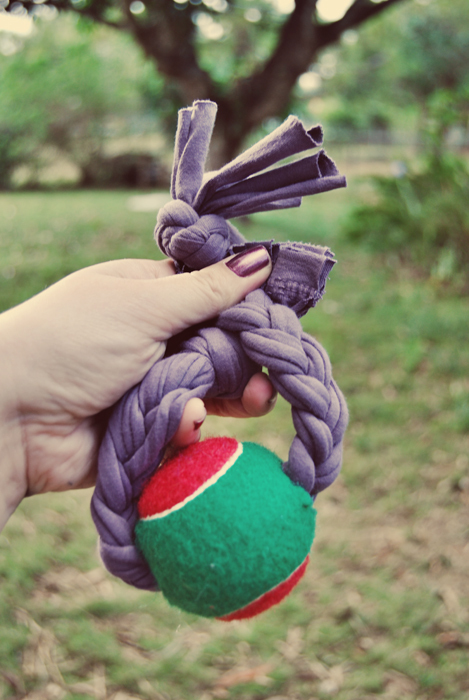 Made by plaiting strips of old t-shirts and threading the braid through the ball, this is a simple and effective toy for your dogs. This toy is a variation on the popular monkeys fist toy that is also easy to make. 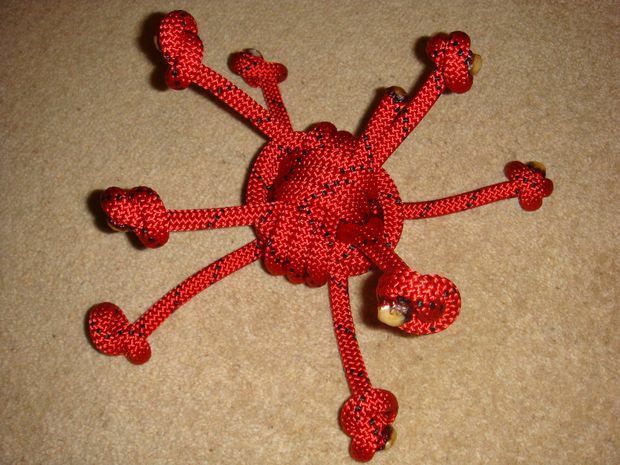 The spider rope toy has the added bonus of bits poking out to amuse your dog just a bit longer. Learn how to make it from instructables, here. Don’t forget to make smaller versions for smaller dogs or cats. Ammo The Dachshund’s Owner is always making him DIY toys and treats, this one particularly caught our eye. 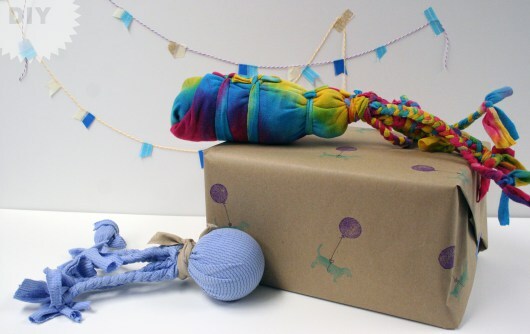 The post actually has two toys using the same method of placing a ball (or bottle) in strips of old t-shirt material and leaving the ends loose. This is a great idea to get just the right size toy for your dog (or playful cat!). Get the instructions here. PetDIYs.com is a great place to find DIY toys and treats for a whole host of pets. This foraging toy is great for Parrots and other large birds and so easy to make out of items you’ve probably got in your house already! Check out the instructions here to give your Parrot a new brain teaser! Right at the beginning of July we produced a blog about why you should get a reptile and this next project is one especially for them! Another great project from PetDIYs.com, this hammock is for your terrarium, vivarium, or other reptile enclosure. It’s really easy to make. With a little imagination, the hammock can easily be scaled up to accommodate larger pets such as rabbits and even cats! Get the instructions here! 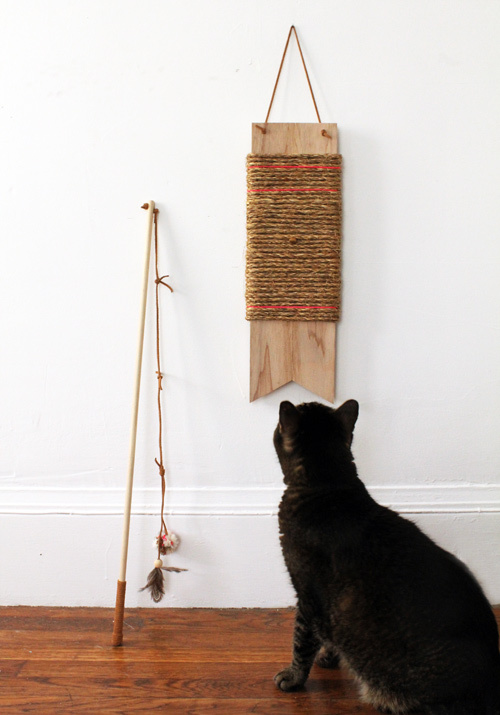 Does your pet love your DIY creations? Has your dog been wrapped in a homemade blanket? Has the cat been sunning himself in a hammock? We’d love to see some of your creations! Get in touch with us on Facebook, Twitter, or leave a comment below!